Download "LLN Tips for Trainers and Assessors"
2 estimating costs. However, all workers may struggle with new tasks or LLN tasks to do with the introduction of technology. 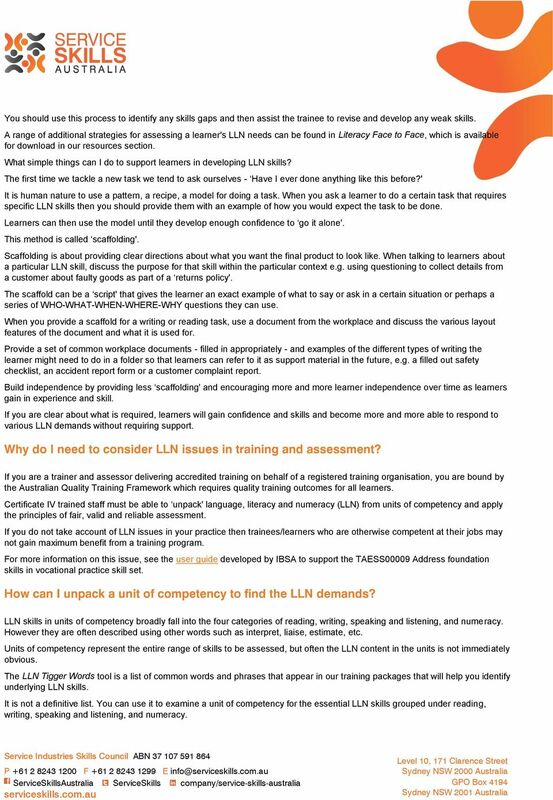 For an introduction to LLN in the service industries, see Module D and download Now Read This from our resources section. For industry-specific resources search our online shop. When we ask someone to write or read or do a calculation it is not to demonstrate the LLN skill alone, but is for a purpose. They write a customer order, they read a recipe or set of workplace instructions, they calculate to give change or to double ingredients in a recipe. Language, literacy and numeracy skills are built-in' to units of competency in Training packages. So when you are training you should assess the level of LLN that is consistent with the performance required within that unit and keep the assessment focus on the job task rather than LLN in isolation. For more information on assessment, download the following from our resources section. Built in, not bolted on LLN Trigger Words Assessing learner's skills with a generic LLN test will give you results that are unrelated to the skills required on the job. One way to get some information about learners' skills is to use a self-assessment tool (based on skills required on the job). The best way to get a sense of a learner's LLN skills is to observe them performing the LLN skills required on the job. 3 Step 1 Use a self-assessment checklist, e.g. the example below, based on the aspects of the workplace. You can change the content of the list to match the requirements of the workplace. 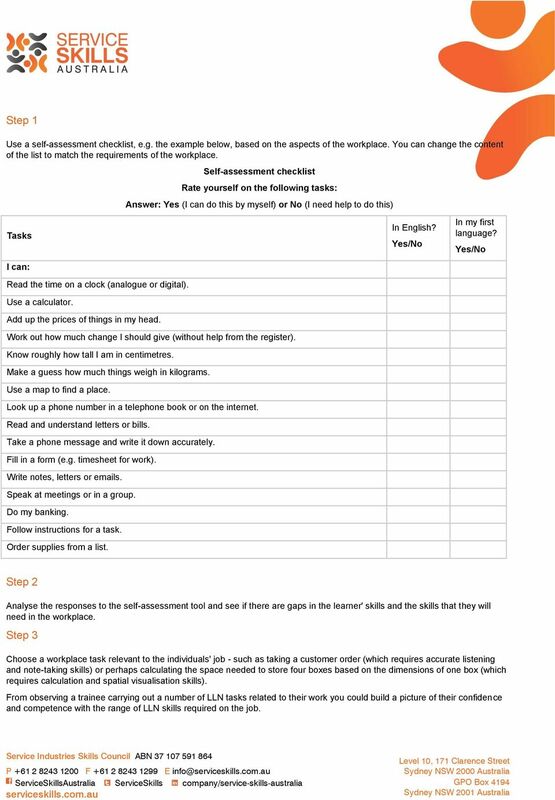 Self-assessment checklist Rate yourself on the following tasks: Answer: Yes (I can do this by myself) or No (I need help to do this) Tasks I can: Read the time on a clock (analogue or digital). Use a calculator. Add up the prices of things in my head. Work out how much change I should give (without help from the register). Know roughly how tall I am in centimetres. Make a guess how much things weigh in kilograms. Use a map to find a place. Look up a phone number in a telephone book or on the internet. Read and understand letters or bills. Take a phone message and write it down accurately. Fill in a form (e.g. timesheet for work). Write notes, letters or s. Speak at meetings or in a group. Do my banking. Follow instructions for a task. Order supplies from a list. In English? Yes/No In my first language? Yes/No Step 2 Analyse the responses to the self-assessment tool and see if there are gaps in the learner' skills and the skills that they will need in the workplace. Step 3 Choose a workplace task relevant to the individuals' job - such as taking a customer order (which requires accurate listening and note-taking skills) or perhaps calculating the space needed to store four boxes based on the dimensions of one box (which requires calculation and spatial visualisation skills). From observing a trainee carrying out a number of LLN tasks related to their work you could build a picture of their confidence and competence with the range of LLN skills required on the job. 4 You should use this process to identify any skills gaps and then assist the trainee to revise and develop any weak skills. A range of additional strategies for assessing a learner's LLN needs can be found in Literacy Face to Face, which is available for download in our resources section. What simple things can I do to support learners in developing LLN skills? The first time we tackle a new task we tend to ask ourselves - Have I ever done anything like this before?' It is human nature to use a pattern, a recipe, a model for doing a task. When you ask a learner to do a certain task that requires specific LLN skills then you should provide them with an example of how you would expect the task to be done. Learners can then use the model until they develop enough confidence to go it alone'. This method is called scaffolding'. Scaffolding is about providing clear directions about what you want the final product to look like. When talking to learners about a particular LLN skill, discuss the purpose for that skill within the particular context e.g. using questioning to collect details from a customer about faulty goods as part of a returns policy'. The scaffold can be a script' that gives the learner an exact example of what to say or ask in a certain situation or perhaps a series of WHO-WHAT-WHEN-WHERE-WHY questions they can use. When you provide a scaffold for a writing or reading task, use a document from the workplace and discuss the various layout features of the document and what it is used for. Provide a set of common workplace documents - filled in appropriately - and examples of the different types of writing the learner might need to do in a folder so that learners can refer to it as support material in the future, e.g. a filled out safety checklist, an accident report form or a customer complaint report. Build independence by providing less scaffolding' and encouraging more and more learner independence over time as learners gain in experience and skill. If you are clear about what is required, learners will gain confidence and skills and become more and more able to respond to various LLN demands without requiring support. If you are a trainer and assessor delivering accredited training on behalf of a registered training organisation, you are bound by the Australian Quality Training Framework which requires quality training outcomes for all learners. Certificate IV trained staff must be able to unpack' language, literacy and numeracy (LLN) from units of competency and apply the principles of fair, valid and reliable assessment. If you do not take account of LLN issues in your practice then trainees/learners who are otherwise competent at their jobs may not gain maximum benefit from a training program. For more information on this issue, see the user guide developed by IBSA to support the TAESS00009 Address foundation skills in vocational practice skill set. LLN skills in units of competency broadly fall into the four categories of reading, writing, speaking and listening, and numeracy. However they are often described using other words such as interpret, liaise, estimate, etc. Units of competency represent the entire range of skills to be assessed, but often the LLN content in the units is not immediately obvious. The LLN Tigger Words tool is a list of common words and phrases that appear in our training packages that will help you identify underlying LLN skills. It is not a definitive list. You can use it to examine a unit of competency for the essential LLN skills grouped under reading, writing, speaking and listening, and numeracy. 5 As you do so, you may identify other trigger words indicating LLN content that you could add to the list. There are a number of resources that are available to help you with LLN issues. As an introduction, download Now Read This from our resources section. Then browse our online shop for industry specific resources. Finally, LiteracyNet has a number of good resources. Also contact the learning support or literacy department or library of your registered training organisation. How can I develop skills in dealing with language, literacy and/or numeracy in training? Completing the Certificate IV in Training and Assessment unit of competency TAELLN411 Address adult language, literacy and numeracy skills will improve your learning and assessment practice by adding to your knowledge about language, literacy and numeracy (LLN) in training and assessment. Just like any other practical skills, the most effective way to learn new LLN skills is to learn them as you need to use them, and to build on existing skills. The development of LLN skills can be enhanced by: learning skills in application, not in isolation having access to skilled people who can show how to apply the skills getting constructive feedback on performance. You need to be aware that the ability of learners to read, write, listen and speak will have an impact on their learning. Consider the sorts of language skills that underpin the technical skills in units of competency, as well as the workplace context in which the skills will be used. Some learners struggle when applying their LLN skills to the requirements of new workplace tasks. Here are some tips. Check that the LLN competencies required for training and assessment do not exceed those required for workplace competency. 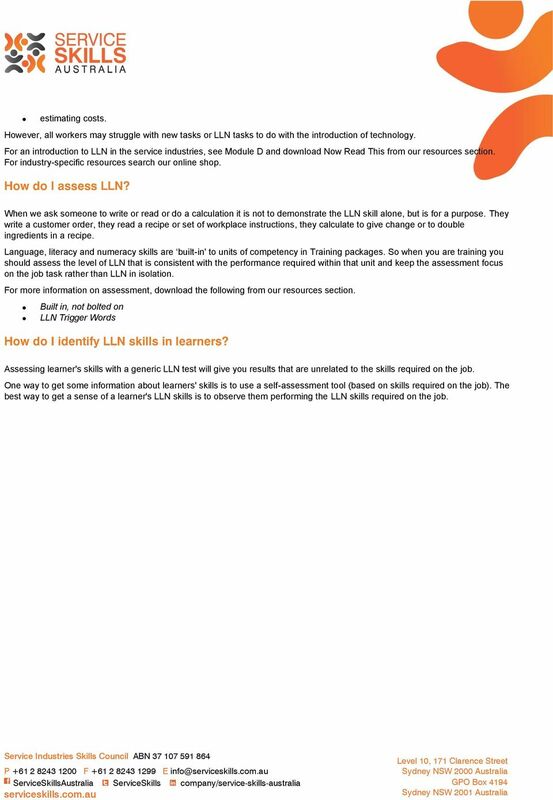 Check that the LLN skill is being used in the way in which it would be applied in industry. Show learners how to perform the task in context, give them constructive feedback on their performance, and let them practice. Monitor the participation of learners. Make sure any materials provided are appropriate and, as part of sound teaching practice, reinforce learning through active demonstration and explanation as well as through any printed or electronic materials. If you forget to be alert to language when planning and conducting training and assessment, various problems can arise for learners and the registered training organisation. You may end up with training materials that are so ambiguous or jargon-ridden that no newcomer to the subject could hope to understand them. Or you could have an over-dependence on self-paced written materials, thus over-inflating the requirement for reading and writing beyond what is required for workplace competency. 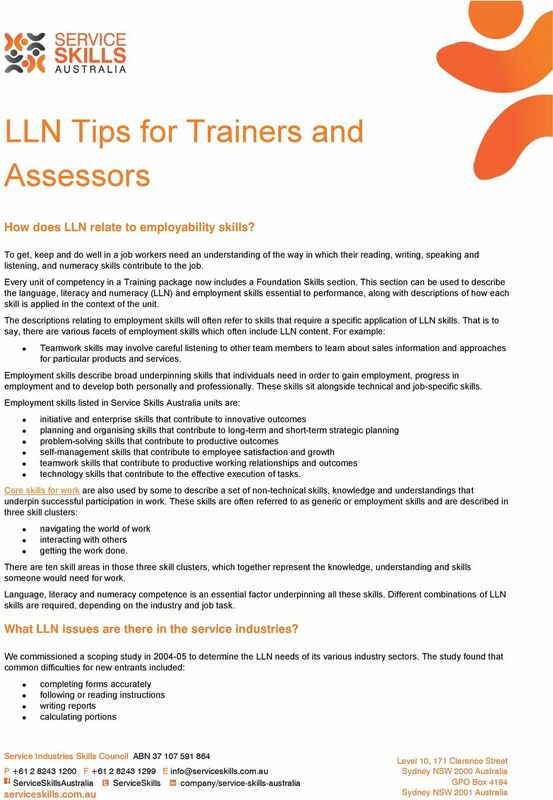 You need to consider what LLN skills the learners will need to make use of in the training and assessment materials. You should also consider the methodologies to be used in training and assessment activities and whether the language and literacy used will impede or support learning. If you are using an LLN specialist, you may find it more effective to bring them into the training environment, rather than working in isolation. For example, learners involved in metal fabrication could be taught geometric principles while they measure the actual metal to be worked on, rather than through abstract concepts alone. In this way the industry application of the formal LLN processes becomes part of the learning process. Having an LLN specialist in the training environment in this way may help learners to apply the formal literacy or numeracy processes to industry tasks. The unit of competency in the Certificate IV in Training and Assessment (TAELLN411 Address adult language, literacy and numeracy skills) will provide you with the range of skills you need. 6 An LLN specialist is a teacher who holds specialist qualifications or has years of experience working in LLN-support programs. There is no mandatory qualification for LLN specialists, however there are a number of VET qualifications that can be downloaded from training.gov.au which build practitioner capability in supporting LLN skill development, including: the TAE skill set TAESS00009 Address Foundation Skills in Vocational Practice and its three component units of competency: o TAELLN411 Address adult language, literacy and numeracy skills o TAELLN412 Access resources and support to address foundation skills in vocational practice o TAELLN413 Integrate foundation skills into vocational training delivery. the TAE80113 Graduate Diploma of Adult Language, Literacy and Numeracy Practice. A range of higher education qualifications in related LLN areas (e.g. TESOL) is also available. Individual universities can provide details of such courses. A person with these qualifications combined with experience in VET could be considered an LLN specialist. 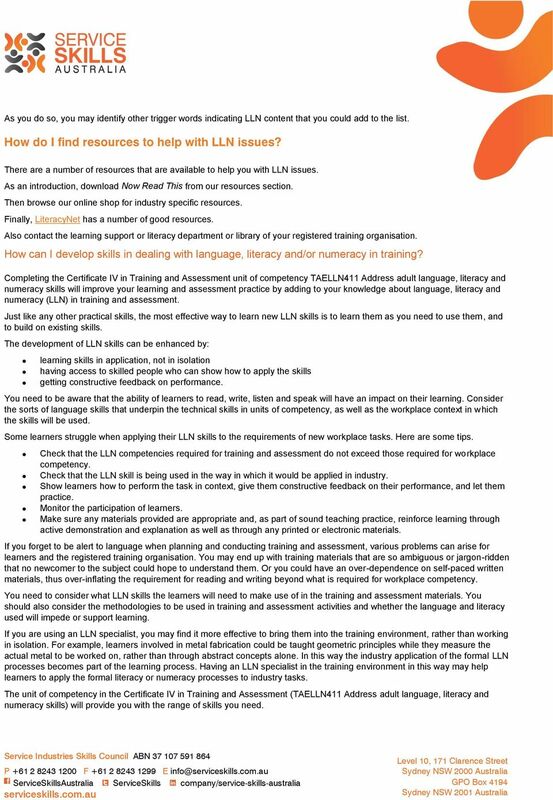 Contact your preferred registered training organisation and ask to speak to an LLN specialist. Welcome to the HBA learning Centres Info board. The Australian Institute of Education and Training provides two options for you to complete the Certificate IV in Training and Assessment. TAE40110 Certificate IV in Training and Assessment. Course Information and Application Book 2016 Block Delivery Program. RTO No. The CARE CERTIFICATE Your personal development What you need to know THE CARE CERTIFICATE WORKBOOK Standard Developing a personal development plan (PDP) Personal development happens throughout your life. Visit us on Facebook. Thank you for your interest in Trainwest.